St. Vincent and the Grenadines will have a mountain to climb to advance to the next stage of the Caribbean Football Union (CFU) Youth Cup which opens in Trinidad and Tobago next Monday. The local Under-17 footballers are drawn in Group C along with Suriname, the Netherlands and Barbados. This grouping sees the three second-placed teams that advanced to the quarter-finals at last yearâs Under-15 Invitational tournament battling for a spot. Barbados did not participate in the inaugural tournament in 2005. The August 14 to 26 tournament serves as a qualification round for the CONCACAF Zone to next yearâs Under-17 World Cup final in Korea. Twenty-three CFU nations along with last yearâs winner Canada, El Salvador, Guatemala, Mexico and Panama are drawn in seven groups, with the group winners and the best second-placed squads advancing. The best CFU finisher in the tournament excluding Jamaica, along with Honduras, Mexico, Canada, USA, and two teams from Central America will compete in the CONCACAF play-off next April. The play-off will take place in Honduras and Jamaica. The two top finishers from each group will qualify for the finals, with the two third-place finishers meeting in a two-game playoff for the final Confederation berth in the FIFA event. 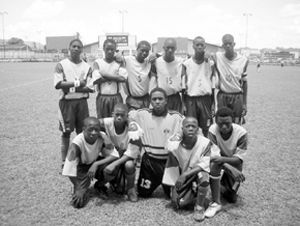 The young Vincentians open their campaign against Suriname August 15. They meet Barbados August 17, and their final preliminary match against the Netherlands is set for August 19 at Berchin Castle in Couva. St. Vincent and the Grenadines emerged the best second-placed team at last yearâs outing beating the British Virgin Islands and the Bahamas, but lost to eventual third-placed Jamaica. Losing finalist Guatemala ousted the Vincentians 4-0 in the quarter-final. Nine newcomers make up the 20-man team that travels to the twin-island republic tomorrow. Kyle Dells, Gildron Edwards, Nicholas Richards, Sheffique Roberts, Antonio Douglas, Delohnni Samuel, Royburn Dickson, Reginald Richards and Romelle George are making their debut. Returning from last yearâs team are Ronnel Hunte,Justin Stapleton, Renaldo Roberts,Jaron De Roche, Ezra Alleyne, Jua Charles, Akeeno Hazelwood, Ronsil Badnock, Myron Samuel, Dwight Clifton and Chad Balcombe. Notable absentee from this yearâs squad is Michael Collis, a hard-nosed midfielder who won the admiration of all those who saw him in last yearâs sojourn. Collis has left for the USA. The technical team comprises Zoran Vranes -Head Coach, Tyrone Prince- Assistant Coach, Christopher Harry- Kit Manager, Asberth Williams- Manager and Dr. Perry De Freitas team doctor/physiotherapist.